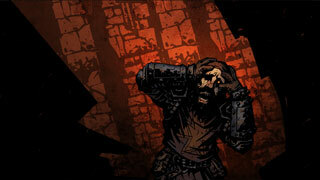 The stress-inducing gameplay of Darkest Dungeon is coming to PS4 and PS Vita next week. We've talked about Darkest Dungeon coming to PS4 and PS Vita before, and next week, it will finally happen. Sony has added some more info about the launch today, revealing that Red Hook Studios has added some special rare trinkets for the upcoming console version. When you start a new estate, you'll receive both a Stone of Patience and a Stone of Endurance, tokens of thanks from Red Hook. There are also three new "extremely rare" trinkets. that can be found in the game. One of these, "The Tempting Goblet," can be acquired from the Skeletal Courtiers in the game. All of game's main dungeons have been punched up, adding more variety. There's also a new town event, titled "A Long Day Awaited." This event fills the stagecoach with bonus recruits. Alongside the launch comes a 20 percent discount on the game for PlayStation Plus members. That discount will be available for two weeks after the launch. The game will be offer both cross-buy and cross-save features as well. You can read up on everything about the console version over at the PlayStation Blog. Darkest Dungeon hits PS4 and PS Vita next week, on September 27. I have been waiting for this to show up on PS4 ever since they first said, "Um, yeah...we'll get it there eventually." Really excited about it, and it's nice to see that I'll get a discount too. When a PC game comes to consoles...they should update the PC version to use controllers. I dont know if they are planning on doing that or not, but I prefer controllers and would rather buy the game on Steam, and dont want to choose between those two wants. Even though I prefer mouse/keyboard universally; I agree completely. My GF hates playing on anything but a controller and this would be a great thing. does my PC version have those trikets as well?